If you're an infopreneur or online marketer, you might wonder whether it's worth putting much effort into your Instagram account at all. Here's my take on it: If you've decided to be on Instagram and you are posting photos, then yes – it's worth putting the effort in. You want to make sure your Instagram feed looks great, as it's another part of your online presence, and represents your brand. So if you're still reading, I'll take it that you want your business to look good on Instagram. 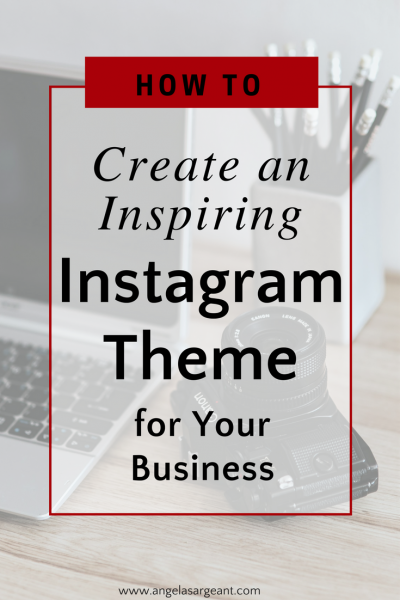 One of the quickest ways to create a positive impression on Instagram, is to have a theme. An Instagram theme is an aesthetic or ‘look' that you create with your photos, to give your Instagram profile a cohesive feel. In simple terms, it is the visual style of your Instagram profile. It's all about customer psychology. 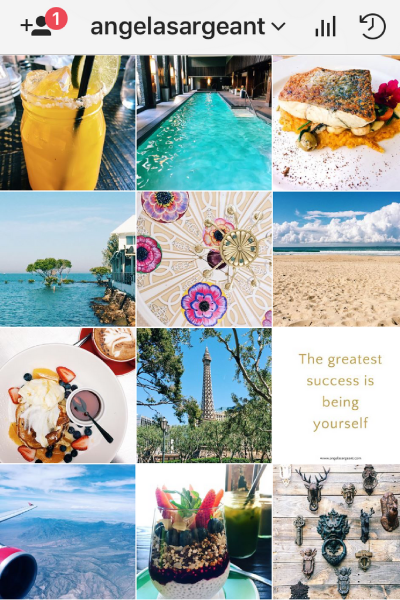 Having a theme means your Instagram profile not only looks attractive, but subconsciously it also gives your visitors the impression of a professional page. And you are essentially telling people “This is what to expect when you follow me on Instagram”. Because we have so many choices these days, people are much more discerning as to who they follow and connect with online. An Instagram theme grabs people's attention long enough to read your bio on Instagram to see what you're about. It also gives people a quick way to make up their minds whether to follow you or not in the first few seconds of seeing your profile. There's more themes to choose from than you'll ever have time to go through. And, of course you can also create your own distinct theme. But let's keep it simple for now. Here's a few themes you might want to consider to get started. Quite simply, this theme is based around a particular color or combination of colors. A color theme is not only visually appealing but also fairly easy to do, especially if you decide to use just a few colors. Using Stock Photos instead of taking the photos yourself, also makes the job easier. You can choose anything from black & white to your favorite colors. And if you're really daring, and it suits your business, then you can create a rainbow theme so that your photo colors change every so often. This is a lot more difficult to achieve and I'll explain a little further down how to do this. A color theme will give you a wonderfully cohesive look. A great example of this is is Chelly Picone's Instagram, as shown below. 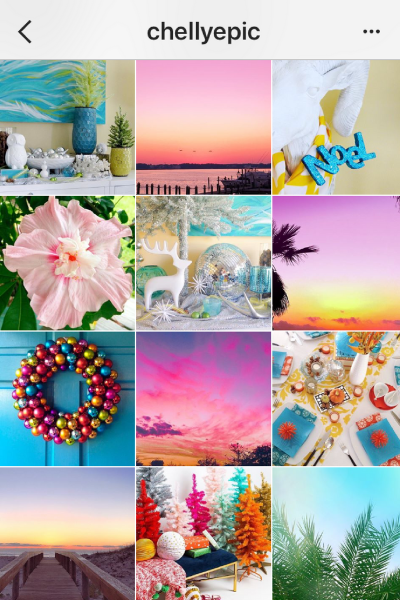 Chelly uses lots of pinks, blues and yellow in her beautiful Instagram theme. These sorts of themes create a visual pattern when you look at them. One example is to insert a specific photo in every second image to create a chequerboard. With Instagram being in blocks of 3 images, you might prefer every third, sixth or ninth image. You can see in the example below, Kelli Wallace, a food blogger, has created a pattern theme in thirds. 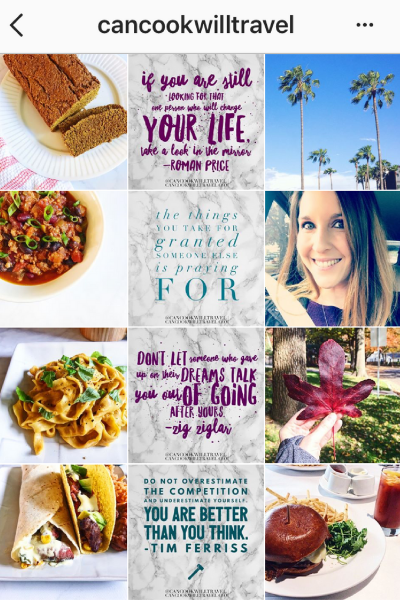 Kelli creates columns in her Instagram theme using food and lifestyle photos along with quotes. With Kelli's theme, every time she posts, all the photos will shift along so that the row of quotes for example, will either be in middle (as shown below) or on the left or right. Regardless of where the photos appear, they'll always be in columns. Borders can help you create a beautifully sophisticated and cohesive look for your Instagram. 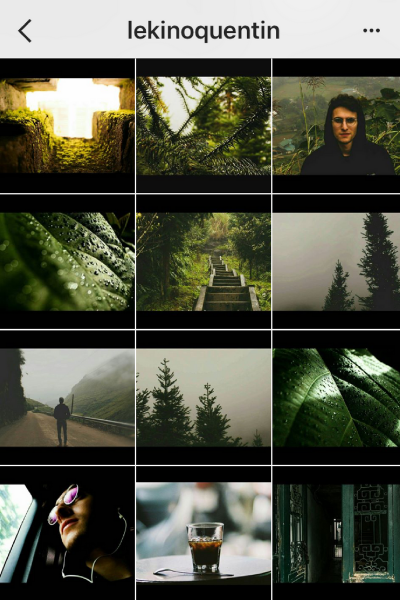 In the example below, Quentin Lekiño has used both color and a black border for a stunning Instagram theme. Although, you can easily go with just borders and no color theme if you wish. Also try the same idea with a white border for a completely different feel. A white border will take this striking theme to something more fresh and airy. Again, it all depends on the look and feel you want to create. To create borders on your photos you can use an app like Whitagram, or Plann, simply upload your photos to the app and then select the border you wish to add. Because I use my own photos on Instagram, and I'm not a photographer by any stretch of the imagination, I use a filter to create a more cohesive look to my Instagram. A filter is simply software that allows you to change the look of a photo. The trick is to use the same filter for every photo, to pull together a certain ‘look'. While I concentrate on posting social media tips in my Instagram comments, my overarching photography theme is ‘lifestyle'. So to make my “on the go, iPhone photos” all fit in a little better with each other, I use a filter which changes the exposure and saturation of my photos to the same degree every time. This means I don't have one photo which is super bright, while another photo is muted, even if my photos are taken in different types of weather or are indoor photos. Instagram has it's own filters which you can use, but there are also other options if you want something a bit fancier. VSCO is a popular photo editing app which has some free filters, and an online store with an extensive selection of filters to buy. Of course you don't have to recreate a theme that's already been done. How about creating your own special style of theme? Remember you can mix and match themes to create something that is uniquely yours. For example, you may want to use a specific combination of colors and a filter. Or try a pattern with a border. You can go as simple or as complex as you like. Before you jump into posting on Instagram with your new theme, you'll want to consider if it's a theme that's easy to sustain. While you might find a theme you get excited about, you need to know you'll be able to sustain that theme, day in day out. For example, if you decide to go with an orange color theme, and you're taking your own photos, you might find you run out of photo ideas quickly. On the other hand, if you go for black & white photos, then you can easily take your photos in black & white, or edit them afterwards. Will my Instagram theme look good? Sometimes how we see something in our minds, and how it looks in real life can be two very different things! A good way to test out your theme before you release it to the world, is to use an app which lets you see the overall look before posting on Instagram. My favorite app to pre-plan my Instagram gallery is Plann. Plann is an “all in one” Instagram app that allows you to plan your photos, edit, schedule and view analytics. Using the Plann app, you can drag and drop your photos around so you can see what your overall theme is going to look like before you actually post your photos on Instagram. Planning your photos ahead of time will help eliminate any little accidents. It'll help you avoid posting the wrong image, which can be especially annoying if you're creating a pattern like the column example above. I recommend planning out a whole month of photos in advance. Doing this will also ensure that it represents your brand the way you want it to. Once you have a look you're happy with, you can then schedule your photos to post on Instagram. So now you've chosen your theme, but how do you start? And what if you already have some sort of theme happening which you're not happy with and want to change? There's a few different options you can use to transition into a new theme. The fastest and easiest option, is to just do it! If you don't have a theme already then I suggest this method. Or if you're changing themes, and don't think your followers will get confused by the sudden change, you can rip that bandaid off and start your new theme right away. Another option is to add three blank photos or three photos with your logo before you start your new theme. This creates a divider between your last set of photos and your next ones. A divider clearly shows that something new is coming up and you can make a clean start. You can also use this technique when you're doing a launch, or if you have a big announcement to make and want to create a sense of expentancy. If you're changing colors, then a third way to move into your new theme, is to use a transition photo. To do this, select a photo which has both the previous color and one of your new colors in it. This will create a bridge between your previous photos and the ones coming up in the new colors. This is a little trickier but can be achieved with a little trial and error. With this option you definitely want to use an app like Plann to see if your transition looks smooth. Also, this option is the one to take if you are creating a rainbow theme and want to change colors say every few rows. Now you have all the tips and tools you need to create an inspiring Instagram theme for your business, it's time to give your Instagram a makeover. And when you're done, let me know! Just visit me on Instagram and let me know, so I can check out your Instagram gallery. Thanks so much Kafil! I appreciate the time you took to leave a comment.